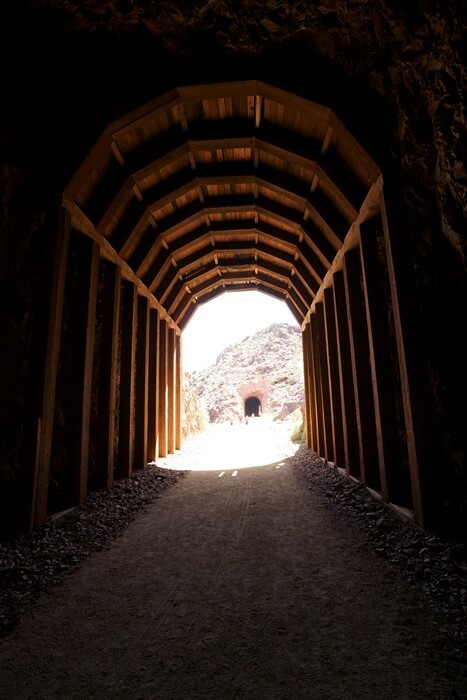 When you find yourself looking for an easy hike on the east side of Las Vegas, you can’t do better than the Railroad Tunnel Trail above Lake Meade. 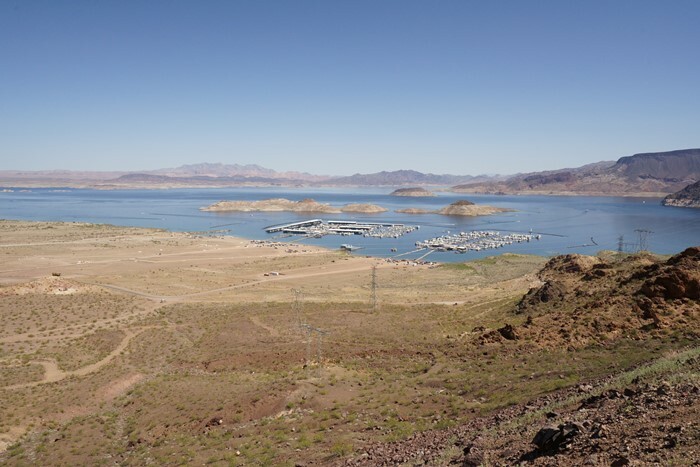 This former railroad bed provides some nice views of the lake, and lets you learn about how the old railroad was used to help build Hoover Dam, just a few miles away. Keep in mind, though, it’s a hike meant for the cooler months of the year, and the trail is closed during the summer. 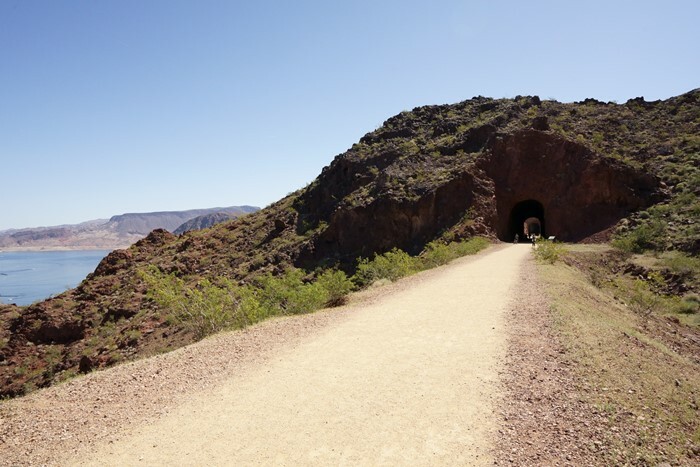 The Railroad Tunnel Trail begins near the Alan Bible Visitor Center. From the Las Vegas Strip, take Interstate 215 south, then Interstate 515 (future Interstate 11), which turns into US 93. Go through Boulder City, then turn left onto Lakeshore Road. 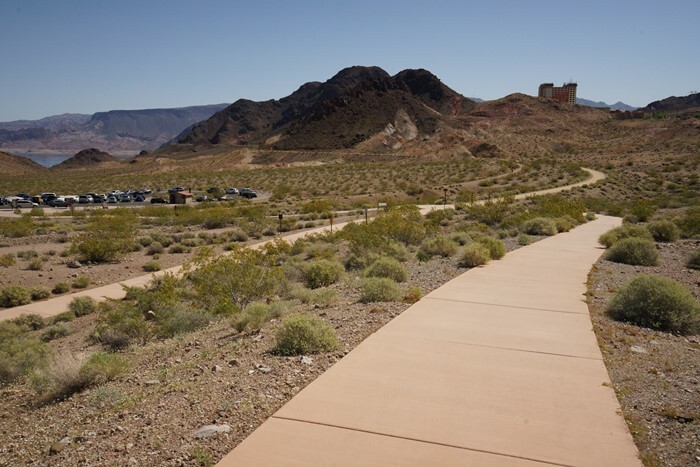 The Visitor Center is the first right, the parking area for the Railroad Tunnel Trail is the second right. If the parking area is full, you can park at the visitor center and hike down a connecting trail. This is not a hike where you’ll find solitude. In fact, on the day I hiked it in early April, the trailhead parking lot was full. After circling a few times, I headed back up the hill to the Alan Bible Visitor Center, and parked there. A connector trail (seen here) runs from the visitor center parking lot down to the railroad tunnel trail. Once you’re on the main trail, you won’t hike far until you reach this big gate. Signs warn of the dangers of heat exhaustion and proper hydration. Make sure you bring some water with you, no matter what time of year you’re hiking. In the hottest months, this gate may be closed and locked. 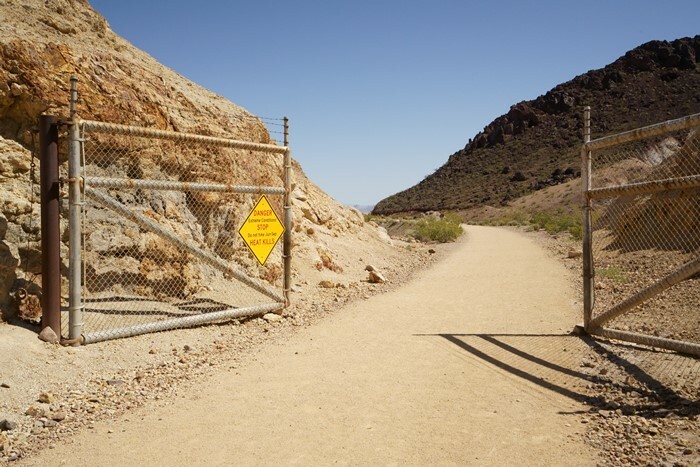 You’ll have to hike about a mile from the trailhead before you arrive at the first tunnel. The trail is wide and flat, and since it’s dog-friendly, you might encounter some dogs on leashes. 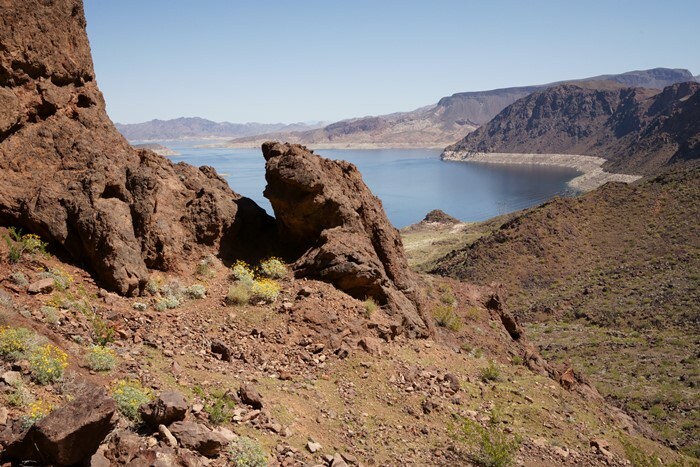 Throughout the hike, you’ll have stunning views of Lake Meade on the north side of the railroad tunnel trail. 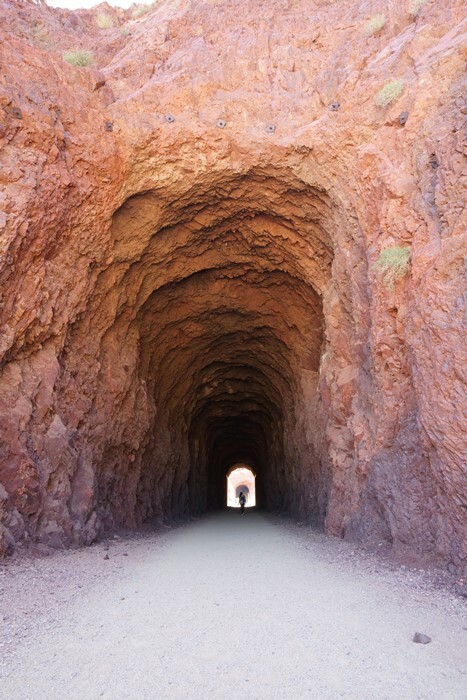 About one mile into the hike, you’ll come upon the first of five tunnels. The first thing you might notice is how big these tunnels are. They’re much taller than a normal railroad tunnel. The extra height was necessary to haul big equipment to the Hoover Dam during construction. For the most part, the tunnels are chiseled through solid rock. In some places, though, there is a framework of wood timbers to protect against cave-ins. Also, don’t be surprised if you see some bats clinging to the ceiling. They will probably leave you alone and stay on the ceiling unless you’re visiting around dawn or dusk. The second tunnel follows quickly after the first. The third and the fourth aren’t much further after that. 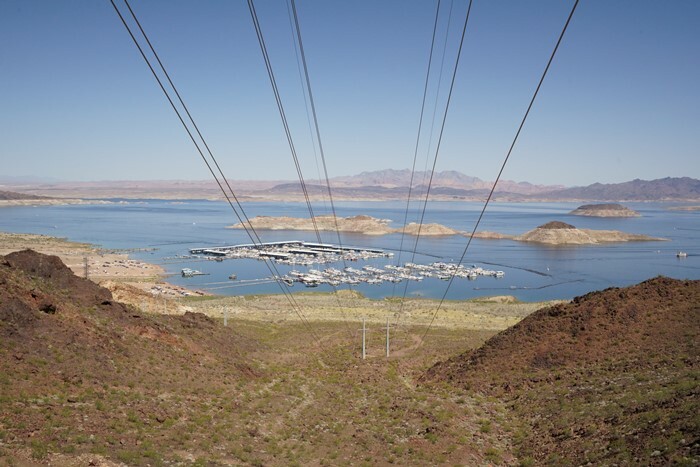 Since you’re pretty close to Hoover Dam, power lines will be everywhere. … but if you get creative, you should be able to grab a few nice shots without any wires. I hiked as far as the fourth tunnel before I had to turn around — that’s roughly a two-mile hike from the trailhead, one way. The hike to the fifth tunnel would have added another quarter-mile (one way), but I was running out of time. After the fifth tunnel, the trail continues to the parking structure on the Nevada side of Hoover Dam. 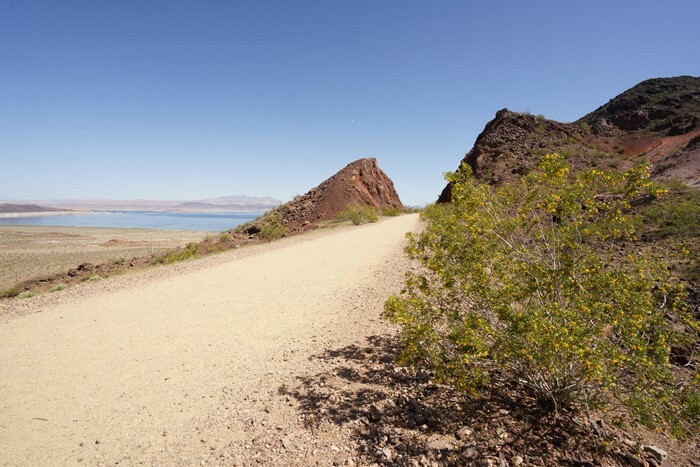 As an alternative to the trailhead near the Alan Bible Visitor Center, you could begin your hike at the dam. Hiking in that direction, you’d come upon the fifth tunnel after about 1.5 miles, and you’d reach the first tunnel in 2.3 miles, one way. Keep in mind, though, the parking garage at Hoover Dam charges $10 for parking. Parking on the Arizona side of the dam is free, but that would add significantly to the distance. Also, the dam end of the trail has a much greater elevation gain (445 feet, versus just 11 feet when starting at the west end of the trail). 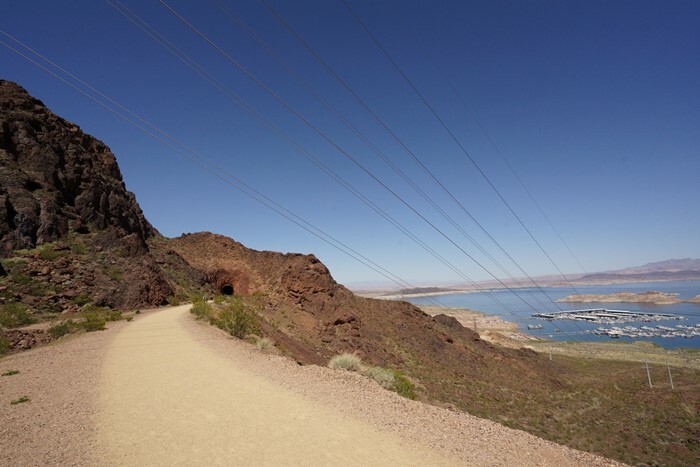 The Railroad Tunnel Trail near Hoover Dam and Lake Mead provides a nice, easy hike with beautiful views along the way. Since it follows an old railroad grade, any elevation change is very gradual. It’s a good trail for families and dogs on leashes, and you’ll get to learn about some of the history of how the dam was constructed.